• A simulation-optimization model for the problem of evaluating a new fractional ownership jets operation, by Juliana da Serra Costa Lopes, Claudio Barbieri da Cunha* [paper in Portuguese]. • Computational procedure for design and prototype of a toll plaza, by Bruno Santana de Faria, Vânia Barcellos Gouvêa Campos* [paper in Portuguese]. • Analysis of the effects of aircraft noise in residential areas surrounding the Brasilia International Airport, by Edson Benício Carvalho Júnior*, Sérgio Luiz Garavelli, Armando Mendonça Maroja [paper in Portuguese]. • Economic liberalization and universal access in air transport: the free market can be reconciled with social goals and still avoid infrastructure bottlenecks, by Nara Zimmermann*, Alessandro V. M. Oliveira [paper in Portuguese]. • Transport infrastructure and economic growth in Brazil, by Geovana Lorena Bertussi*, Roberto Ellery Junior [paper in Portuguese]. • Port efficiency: analysis of the main approaches for the Brazilian ports, by Viviane Adriano Falcão*, Anderson R. Correia [paper in Portuguese]. • Airport planning in Brazil: discussions on contributions of strategic prospective, by George Christian Linhares* [paper in Portuguese]. • Private car use and urban chaos – considerations on the transportation planning of big cities, by Jacqueline Elhage Ramis*, Emmanuel Antônio dos Santos [paper in Portuguese]. • Airside capacity of Brazilian airports, by Cláudio Jorge Pinto Alves*, Rafael Fraga [paper in Portuguese]. • The logistics challenge in an industrial-airport implantation, by Roberta de Roode Torres Matera* [paper in Portuguese]. • Mergers in air transportation: studies and trends, by Thiago Vinicius Alves Ueda* [paper in Portuguese]. 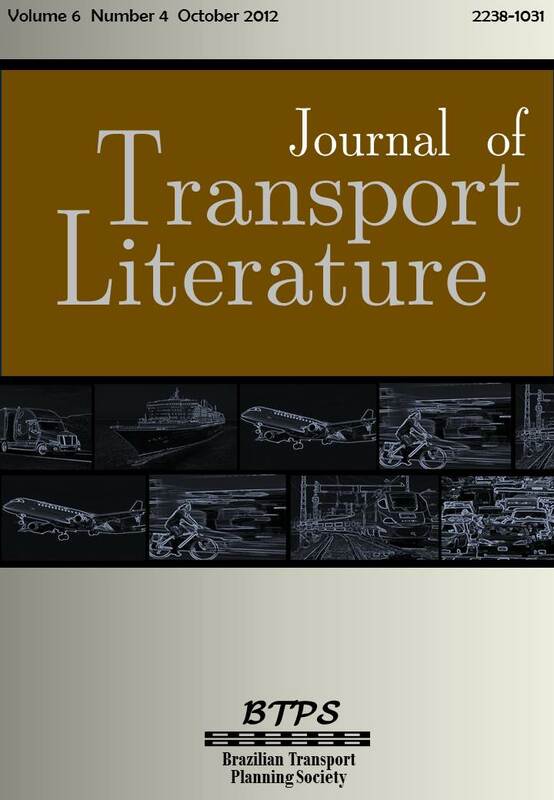 • Protection and liberalization in cabotage transportation system: the regulation use in Canadian and Brazilian markets, by Marcus Vinícius Nascimento* [paper in Portuguese].